Most of us breathed a sigh of relief when we turned the page to a new year, as it seemed like every day of 2017 brought a record-breaking disaster that impacted large areas of the country and put millions of Americans in harm’s way. In its year-end review, FEMA reports that 2017 was a historic year that included “unprecedented disasters that affected more than 25 million Americans (almost 8 percent of the U.S. population).” The agency supported 59 major disaster declarations, 16 emergency declarations and 62 Fire Management Assistance Grant declarations across more than 35 states, tribes, and territories. FEMA, along with its federal partners, provided 138 million meals, 194 million liters of water, 10.2 million gallons of fuel, and installed 1,310 generators to power critical facilities supporting survivors impacted by the four major hurricanes: Harvey, Maria, Irma, and Jose. CNN reports that 2017 was also one of the hottest years on record, “ranked as the second-warmest by NASA and third-warmest by the National Oceanic and Atmospheric Administration.” The previous year, 2016, remains the hottest year on record, with NOAA ranking 2015 the second warmest and the third by NASA. In other words, the top three hottest years have been the most recent three. 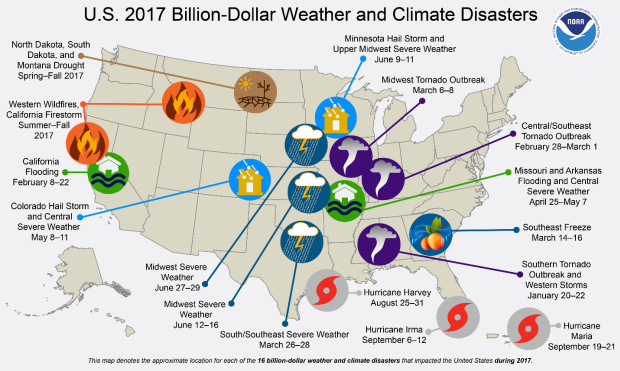 It’s no surprise then that 2017 also turned out to be the costliest year on record for weather and climate-related disasters in the U.S. According to NOAA, losses exceeded $1 billion, with approximately $306 billion in total costs — a new annual record for the United States. Previously, the costliest year was 2005, with losses of $215 billion, in large part because of Hurricanes Katrina, Wilma, and Rita. 2017 also created one of the busiest years for the National Flood Insurance Program (NFIP) to date — thus far, the NFIP has paid out over $8 billion dollars in flood insurance claims. Here’s a look at the jaw-dropping stats of our historic year for disasters. Was the fifth-costliest weather disaster on record, totalling around $50 billion in the U.S.
As if it couldn’t get any worse, 2017 was also a historic year for wildfires across the Western states, including two of the most devastating fires to ever impact California — the Tubbs wildfire in the Northern counties and the Thomas fire, which became the largest wildfire in modern California history. The Thomas wildfire in Santa Barbara and Ventura counties topped 280,000 acres and became the largest single wildfire in California history. FEMA and NWS provided real-time support for local and state authorities through Wireless Emergency Alerts (WEAs) to keep citizens informed of impending dangers. Regardless of the type of event, mass notification played a critical role before, during and following the year’s multiple disasters — underscoring the importance of having systems in place to respond quickly and effectively to a wide range of weather-related threats and natural disasters. Clients of Regroup located in impacted areas had the tools to disseminate those critical alerts and updates to their network via all communication channels being leveraged during catastrophic events. This included messages sent via mobile app (SMS/text and push), social media, email, landlines, website portals, and more. See for yourself how Regroup’s robust, yet user-friendly mass communications platform can help you keep the lines of communication open during catastrophic events. Give us a call at 1-855-REGROUP or email inquiries@regroup.com to schedule a customized demonstration of our award-winning system. Ensure your organization can weather the next storm with Regroup.